Danjjroberts | Have you tried Classcharts yet? Have you tried Classcharts yet? It has taken me a year to finally write about Classcharts and to be honest I love it and as a school we have still only just used about 10% of what it can potentially do. The reason behind this is that we didn’t want to overload our staff as they had other technology that they were embedding and sometimes you can just try to do too much. For the last 12 months after killing off our out of date, extremely expensive and ineffective VLE as we knew it we decided to make one ourselves. 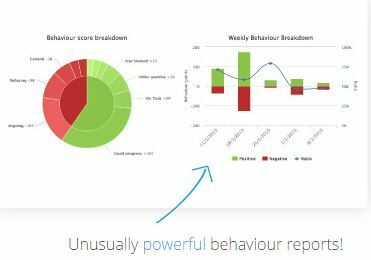 One of the main things though that we couldn’t deliver ourselves and we knew from our consultation that our students and parents valued was the real time reporting of behaviour both positive and negative. The best by far on the market for value for money and in all reality could deliver so much more was Classcharts. You can see below that each student and parent has a login to see a real time report of commendations and sanctions that are recorded in sims, visually this is extremely powerful. As a senior leader how I used it on a daily and often hourly basis was to browse the activity feed on my desktop and also mobile when I was walking round. This gave me like a news or twitter feed when any positive or negative behaviour was recorded, the beauty was that I often was able to pick up a student recently after something negative had happened and proactively intervene and follow it up if necessary. This real time information is so powerful. However this is just the start, I guess the main function and what most people purchase it for (which we are only just starting to explore) is using it as a tool to create seating plans for all your classes and to use a really sophisticated and brilliant analytical system which can tell you based on your own schools data if you sit child a next to child b then child a is likely to have a negative impact on their behaviour and attitude in that lesson. This is incredible! There are still so many other features that I haven’t mentioned because we haven’t switched them on ourselves yet but hope to do soon. Finally however one great part which we hope to explore this year is with regards to rewards. There is a online shopping system where a students positive points can equate to physical rewards which they can ‘cash in’ this is a great way to encourage and reinforce positive behaviour and achievement. This is just a brief post which I hope to add to in the next year. Highly highly recommended- it is so beneficial to have a class seating plan and you can easily see which student has SEN or is Gifted (as well as having a seating plan for anyone observing your lesson). I have used it for last 18 months and really like it. So easy to issue House points at end of lesson etc. Thanks for commenting Bob I forgot about the data! Why can I not click on this link in this blog post?